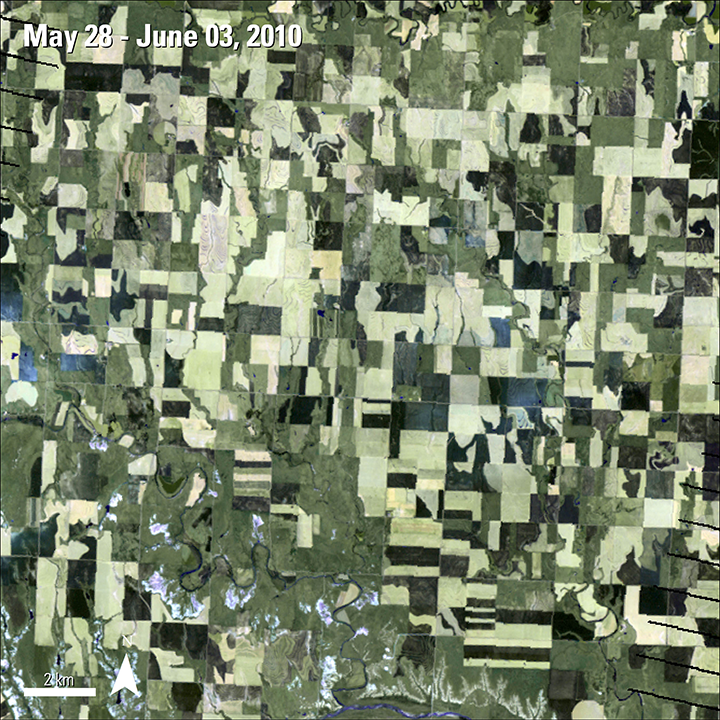 A false color composite using the CONUS weekly WELD (WELDUSWK) data product of agriculture in Collyer, Kansas. Agricultural crops, like those seen in this image, can be automatically identified using algorithms with WELD data. Mar 31, 2016 • [by Danielle Golon​, LP DAAC] Web-Enabled Landsat Data (WELD) is a National Aeronautics and Space Administration (NASA) Making Earth Science Data Records for Use in Research Environments (MEaSUREs) project that created composited mosaics of the Conterminous United States (CONUS) and Alaska using Landsat Enhanced Thematic Mapper Plus (ETM+) data from December 2002 through November 2012. A first of its kind, the WELD data products were designed with the purpose of providing scienctific quality Landat data consistent in both temporal resolution and quality at a continental scale with limited clouds. WELD products are available at no charge. WELD data are useful for extracting agricultural information in the United States. For example, Yan and Roy (2014) use an automated object-based methodology with weekly CONUS WELD data to extract agricultural crop fields in Texas, California, and South Dakota. The authors are able to identify rectangular, center-pivot, and irregularly-shaped agricultural fields from each of these states from 2006 to 2010 by using several algorithms and creating maps from the Normalized Difference Vegetation Index (NDVI) in the weekly WELD product (WELDUSWK). 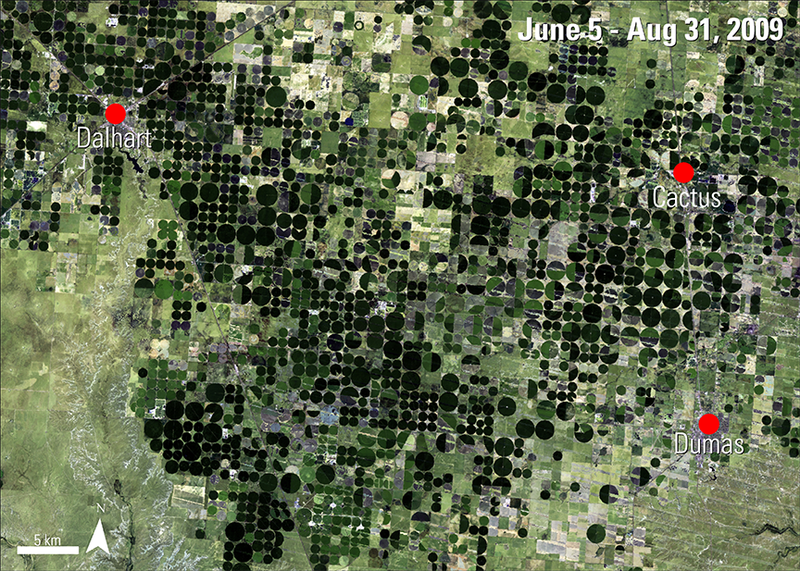 Fields using center-pivot irrigation (the circular fields) and other types of fields in northern Texas are visible in the weekly WELD and summer seasonal WELD images below. Using the authors’ methodology, researchers could automatically identify crops in the weekly WELD image without having to manually examine imagery. The author’s results agree with the Cropland Data Layer (CDL) classification data and independent measurements made by the United States Department of Agriculture (USDA) and the National Agricultural Statistics Service (NASS). Comparison of a weekly and seasonal WELD data product (false color composites). 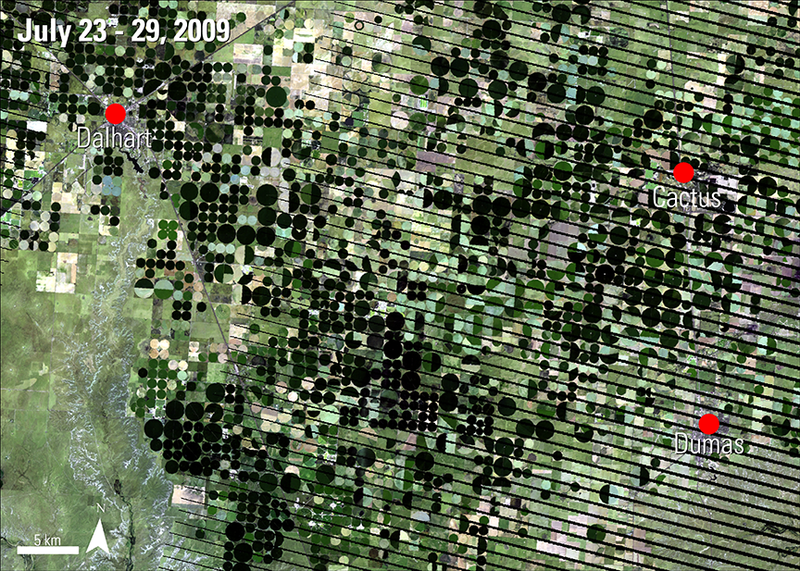 The two images show center-pivot fields, the circles in the image, in northern Texas. The left image is a CONUS weekly WELD (WELDUSWK) image from 2009. The black lines in the image are due to Landsat scan lines. The image on the right features the same area using the CONUS seasonal WELD (WELDUSSE) data product during summer 2009. Using their object-based methodology, the authors can automatically identify types of agriculture in the area. + WELD data of CONUS are offered as weekly, monthly, seasonal, and annual temporal resolutions. + WELD data of Alaska are offered as weekly, monthly, seasonal, and annual temporal resolutions. + WELD data is also available as a 5-Year Land Cover Land Use Change product. Roy, D., Ju, J., Kline, K., Scaramuzza, P., Kovalskyy, V., Hansen, M., Loveland, T., and Zhang, C., 2010, Web-enabled Landsat Data (WELD): Landsat ETM+ composited mosaics of the conterminous United States: Remote Sensing of Environment, v. 114, p. 35-49, accessed February 16, 2016, at http://dx.doi.org/10.1016/j.rse.2009.08.011. U .S. Geological Survey, 2015, Web-enabled Landsat data (Weld Projects): Landsat missions, accessed February 16, 2016, at https://landsat.usgs.gov/WELD.php. U .S. Geological Survey, 2012, Weld: web-enabled Landsat data: U.S. Geological Survey, accessed February 16, 2016, at http://weld.cr.usgs.gov/. Yan, L., and Roy, D., 2014, Automated crop field extraction from multi-temporal Web Enabled Landsat Data: Remote Sensing of Environment, v. 144, p. 42-64, accessed February 18, 2016, at http://dx.doi.org/10.1016/j.rse.2014.01.006. Yan, L., and Roy, D., 2016, Conterminous United States crop field size quantification from multi-temporal Landsat data: Remote Sensing of Environment, v. 172, p. 67-86, accessed February 18, 2016, at http://dx.doi.org/10.1016/j.rse.2015.10.034.